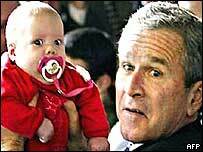 A Beijing businessman has applied to use the Chinese name of US President George Bush to market his nappies. "Back in my hometown in Henan Province, the pronunciation of 'Bushi' sounds exactly like 'not wet'," said the man, surnamed Guo, according to local media. But his application is likely to be rejected, authorities said. "It may bring about bad social impact if a leader's name is registered as a trademark," said an official surnamed Liu at the State Trademark Bureau. George Bush is not the only high-profile American who has appealed to Chinese businesses. Mr Liu said the bureau had just turned down an application by a costume company to use the Chinese translation of "Lewinsky" as a fashion brand. "Merchants are mainly driven by business interests, hoping a popular trade name will lead to a best-selling product," the agency quoted officials as saying.